When I cook for my clients, I almost always bring them a three part meal. Some sort of main, some sort of side, and some sort of starter. If left to my own devices, the starter would always be salad but I don’t want to bore my clients. I do make a lot of salad – rarely the same one twice – but I have also branched out into appetizers and soups. I have really come to appreciate a starter soup because I sometimes find it easier to match them to my menu of the night. In my quest to keep things interesting, I have also branched out into cold soups. And that is where this lovely soup comes in. It comes from Deborah Madison and it is one of my favorites. So much so that I throw that “I don’t really repeat recipes” thing out the window and make it often. We had beastly hot weather in Seattle last week and all I could think about was this soup. There are many things to love about it. It’s cold, it’s refreshing, it’s incredibly rich tasting but actually quite healthy. It is also very adaptable. Madison suggests you use lots of different herbs and that you garnish it with pistachio nuts. I chose to use just a bit of dill, but mostly cilantro to go along with my menu. And I garnished it with roasted pumpkin seeds instead – just to keep the flavors all in the same family. The soup was heavenly with the roasted vegetable quesadillas I made last night (more on those at a later date), but I would be equally happy eating it with a variety of different dishes from different lands. The list of ingredient here may seem long, but the soup comes together in no time. It is just a matter of blending, pouring into a bowl, adding chopped things to the bowl, and refrigerating. This is a great soup to in advance since time in the refrigerator improves the flavor. 1. Purée the buttermilk, yogurt, avocado, and a quarter of the peeled cucumber in a blender until smooth, then pour into a bowl. 2. Mash the garlic with 1/2 tsp. salt and stir it into the purée along with the scallions, herbs, chile, and lime zest. Season to taste with salt, pepper, and lime juice. Finely chop the rest of the cucumber and add it to the soup. Cover and refrigerate until well chilled. Just before serving, taste and adjust the seasonings. I love avocados, but they always ripen at the same time! 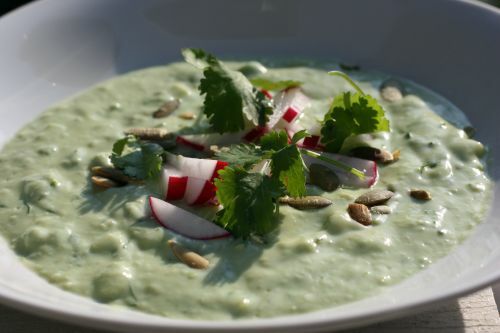 I might try this soup this weekend, I have cilantro that is going to die soon! I have finally come around to cold soups, and I now appreciate them in our never-ending hot weather! This looks fantastic and the garnishes are perfect. 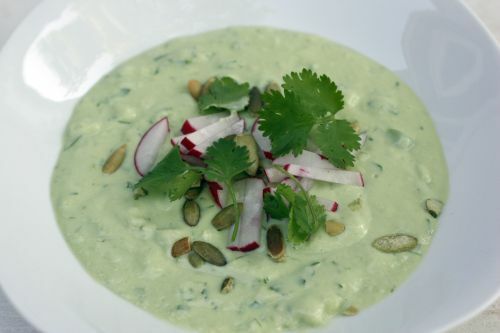 Cold soups never really appeal to me but this soup looks really good! I could eat avocado everyday. I’ll have to try this recipe soon since all I want to eat recently are cold things due to the heat!